For businesses that are responding to the enormous market forces of the digital economy, the customer relationship is everything. Without offering a consistent experience for customers, you will have fragmented, inconsistent processes and services. Everything suffers. But it’s not easy to make the necessary changes if your front office technology is outdated. SAP C/4HANA answers the challenges with five cloud solutions that work individually and together so that you can manage and transform your relationships with customers. 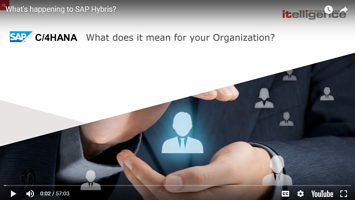 Webinar: What's Happening to SAP Hybris?